The amazing advancements in laminate and hardwood flooring make the decision between laminate and hardwood flooring more challenging than ever. Technological and structural improvements in laminate flooring and in factory-finished solid hardwood floors have led to increased demand for both types. Meanwhile, the manufacturing improvements have reignited the debate between these two stellar flooring solutions. Yesteryear, the decision was usually based upon budget but not today! 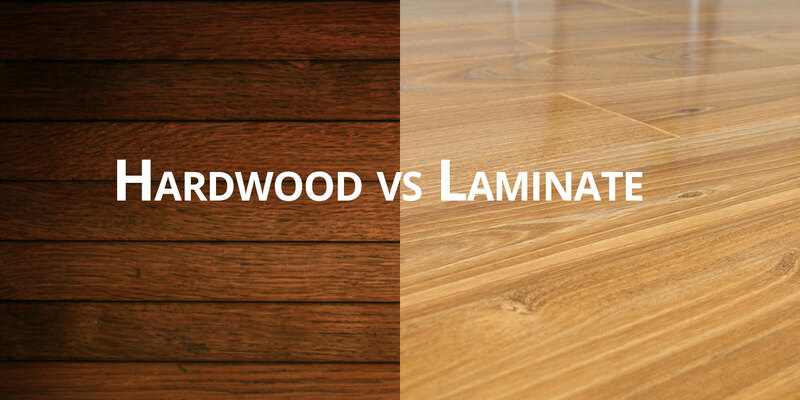 In order to make the best flooring decision for your home or business, the laminate vs. hardwood flooring debate must incorporate an objective and informed analysis of 6 fairly broad elements. Lifestyle or Usage – Homeowners and business owners who impartially assess their lifestyle or usage are more likely to make the right decision. For example, households with young children and a number of pets or a business that experiences high traffic, many deliveries or shipments might find the durability of laminate flooring more productive.However, advancements in hardwood manufactured finishes and maintenance allow hardwood flooring to work in busy offices and in hectic households that take preventive measures, such as trimming pet’s nails and using walk-off matting. Maintenance Commitment – Regular maintenance is important and no floor can survive without degrees of responsible maintenance. However, if the maintenance budget is tight and if inordinate accumulation of dust, dirt and wear and tear is likely, laminate is easier to maintain. More thorough hardwood floor maintenance cannot be put aside but laminate can survive quite well with regular sweeping and vacuuming. Climate and Exposure – Homeowners and business owners must again be objective about the exposure of the floor. Where the floor will be installed is a big consideration. For example, if a bathroom tends to accumulate moisture on the surface, laminate is the more prudent choice. Hardwood floors do not thrive in damp climates with significant temperature swings. Solid hardwood floors should never be installed below grade, a popular setting for laminate flooring. Aesthetic Appeal – Imaging used for laminate can create an amazing likeness to solid hardwood. But, there really is nothing as authentic, durable and enduring as an authentic, solid hardwood floor. Hardwood flooring can also increase the value and demand for your property, be it residential or commercial. If you feel the authenticity of your flooring is important to attract clients or buyers or for the elegant luxury your home requires, hardwood would have to be the right decision. Environmental Considerations – Hardwood gets the nod for renewability and sustainability as hardwood today is drawn from carefully managed forests. But, laminate flooring basically eliminates the destruction of any trees. Yet, laminate floors are made from non-renewable sources.In order to assess environmental concerns, remember that hardwood has a much longer life cycle than laminate. Hardwood floors can last hundreds of years, which is a plus and makes this decision a very tough call. Budget – The cost of laminate flooring is lower than the cost of solid hardwood flooring or reclaimed antique hardwood flooring or exotic hardwoods. Laminate has a shorter life expectancy but is tough, practical, durable and easy to install. However, the return on investment is usually better with hardwood flooring.How tight is your budget? Can you afford to invest in hardwood and maintain it to achieve your maximum return? For a majority of buyers, this is the biggest concern, but certainly not an exclusive consideration. Many hardwood floor owners say that because of its authenticity, the “real feel” and exclusiveness of hardwood flooring, it is more desirable. However, as we can see, there are situations that indicate laminate is the wiser choice. Be sure to consider all the factors and prioritize your needs before deciding. To ensure the most informed decision, contact the flooring solution professionals at Hardwood Floors Fort Worth. Our professionals will take the time to show samples and explain the advantages and disadvantages of each type floor. In the end, that is the best way to make the decision between hardwood flooring and laminate flooring.